Welcome to the Official Hanger Queen 9 Campaign thread, and thanks to John for leading it! The campaign will run from January 1, 2019 through January 1, 2020. Although I want this to be the year I finish the monogram F8F, I suspect my first hanger queen will be the Hasegawa F-20 I'm trying to finish for 3rd Generation jet fighters. Hopefully I will manage to finish one of my self queens this year. Michael, thanks for doing all the admin sort of stuff, without you, we'd flounder I'm sure! Happy New Year to all! Welcome to the Hangar Queen 9 edition! If it's languishing on the shelves, hiding in a box, and at night you hear a faint whisper calling you, then this is the place for you! So, come one who has a model in progress that got kicked to the curb, one deemed too difficult, one that time ran out of on the group build! Doesn't matter, just finish it!! The goal is to finish unfinished projects, that said, I picked up Mauve's P-40N at ATLCON17, it was partially started, but came with 2 True detail cockpits! All for the sum of 5 USD! While not a hangar queen of my making, it qualifies, and I'm more that willing to give it a go. The previous owner/owners did a great job on one of the cockpits, so that will be the one I go with, only a little weathering from me. I did close the cockpit, and the Mauve kit is great! I built this in 1997, and am excited to add this to the collection! 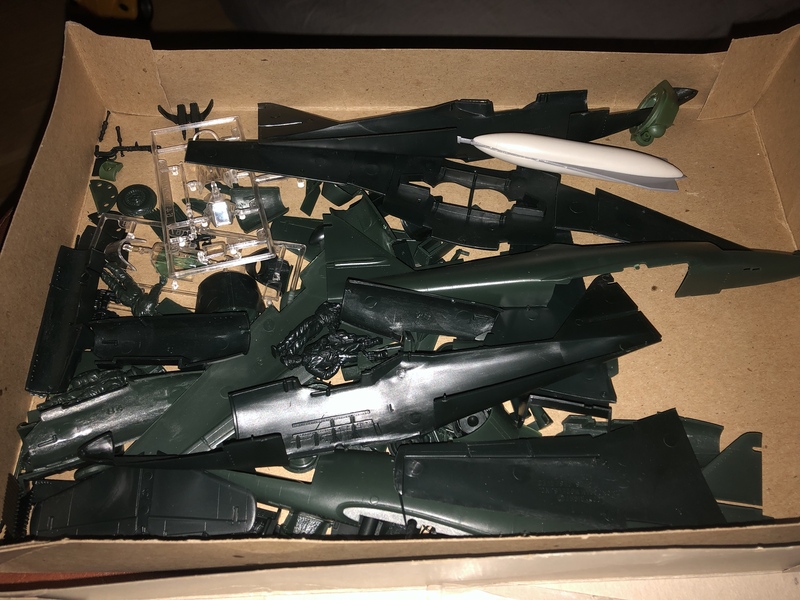 here is my entry my Airfix Defiant night fighter that I started for Airfix 4 but did not finish back in 2017 and has been sitting in this state sense then. Well, I admit defeat in the "Bombers 2" campaign but will try to finish my Frog 1/72 Heinkel He 111H-1 for this campaign. This is the latest photo of where I was. Basically still sanding puttied areas, putting paint over the area to see if I need more putty or sanding, then more sanding, and repeat. I've got several stalled it's just a matter of deciding which one or ones to actually finish. Bring em on! The goal is to get them done! I am going with a Me 262 for this campaign. I will go old school with the Monogram/Revell 1/48 kit. I have a box that should contain two Me 262s. These should have been build a long time ago. Some parts are put together and there are a number of conversions I was planning for these two birds. The conversion(s) planned are a turret mounted belly gun to be able to attack bombers and ground targets at an angle. Another conversion was a standoff weapon against ground targets or big bomber formations. Basically a mini version of the V1 type air launched weapon. One Me 262 will be for this campaign, the other for the "WWII twins" campaign. if I cannot make the conversions I planned or some arts have gone missing I will find another build for this campaign. The stack of semi finished projects is high, so plenty to choose from.